The Goji Smart Lock sounded like a bit of a gimmick when we first heard about it, but the more we looked into it, the more we wanted one. 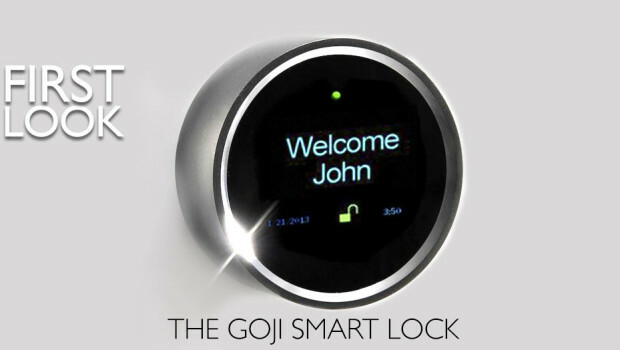 To back-up a bit, the Goji Smart Lock is a front door locking system for the tech-wavy, app wielding consumer. Using the supplied app on your smartphone, you can unlock or lock your door, give time-controlled access to someone else (say, a friend popping round to feed your pets while you are away), plus you can also see who’s at the door via a small built-in camera that sends the image to your phone. It also keeps a log of everyone who’s unlocked the and at what time. It will also send you a text message every time the lock is accessed. Another nice little touch is you can program the smart lock so that it automatically unlocks the door as you approach, saving you fumbling around in your pocket or bag for your phone or keys. You can also get a keyfob which acts the same as the remote central locking key for your car. The Goji Smart Lock looks nice and smart with a stylish circular module that fits over the existing keyhole. It’s available in either gold, silver and copper finishes. If you lose your phone, you can still use your key as a backup and Goji are providing 24 phone support to get you back up and running, along with restricting access to your lost phone. In the event that you have a power cut, it will still work as normal, although it won’t be able to send you text alerts until power is restored. The Goji Smart Lock will work with any wooden or metal door that uses a deadbolt and it’s available now priced at $278 either direct from Goji or through Staples Connect as part of their connected home service.